Bunny has been doing the oddest thing lately – she jumps straight into the air, twists at the height of her jump, and does a barrel roll onto the ground. It’s the oddest thing I have ever seen. I’m going to try to catch it on camera if I can — she usually does it when she’s excited to see me, so I’ll have to get Sean to do it, and he’s camera phobic. What is it with some guys? They’ll obsess over minute details while shopping for cameras or camcorders, but actually use them? No thanks. I shot some video of Mae – Solo’s mom – running around and playing with Delilah, Penelope and Dexter. In one scene, Dex gets right up into Mae’s face and barks his shrill ‘lookatmeLOOKATME‘ bark, until she finally smacks him with a paw. It’s pretty classic. Mae plays exceptionally well with puppies – she just hates Sailor, and the feeling is mutual. I read a great article on how some kids find clowns terrifying. LONDON (Reuters) – Unhappy clowns from around the world say a study that reported that children didn’t like them has wiped the big smile from their faces, and have been falling over their large shoes to put their case. A poll by researchers looking at what decor to put in hospital children’s wards found that youngsters do not like clowns on the walls and even older ones think they are scary. 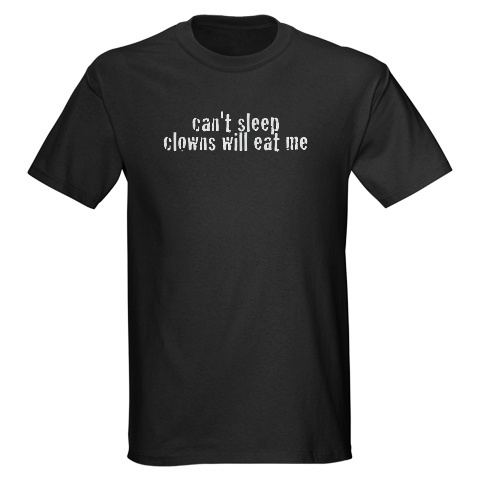 “We found that clowns are universally disliked by children. Some found them quite frightening and unknowable,” said Penny Curtis, senior researcher at the University of Sheffield which questioned 250 children aged between four and 16. But their findings, published in a nursing magazine on Wednesday, has put the red noses of the clowning community out of joint. In a deluge of emails to Reuters, they say they misrepresent just how popular they really are. “The ‘universe’ of 250 children used for the Sheffield University study was miniscule compared to the 250,000 one-to-one bedside visits made by Clown Care to hospitalized children annually,” said Joel Dein, director of communications at the Big Apple Circus in New York. he Clown Care programme has involved two million hospital bedside visits since it began 21 years ago, employs more than 93 professional “Clown Doctors” and has been copied across the world in countries such as Italy and Brazil, Dein said. Other individual clowns pointed out how much children, especially those who are ill, are cheered by them. “I have clowned in hospitals, nursing homes, schools, day care, corporate events ,telethons and am a part of many charity events,” said Elaine “Daisy D.Dots” Vercellone, who has been clowning for 21 years around New York. “There are those who are afraid of clowns, this is unavoidable, the same way that there are those afraid of dogs and spiders,” she said. There’s a shock – does anyone actually like clowns? 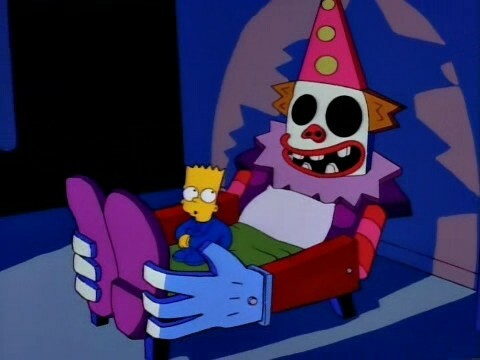 Personally, I’m with Bart Simpson – I once spent the night in a guest bedroom full of clown dolls, and it was impossible to get to sleep. I was convinced the horrid things were moving around every time I closed my eyes. It’s one of the reasons this is my favorite t-shirt.